July 2014 represented one of the most important turnaround points in the oil business in the last decade. An apparently trifling event as the reopening of the Libya’s ports and wells transformed significantly the market. According to the numbers, it was meaningless because Libya’s production jumped from 250’000 bpd to 900’000 bpd over the next three months. The overall production has increased just by 600’000 bpd, a very small figure compared to the overall worldwide production. But it mattered so much because it was unexpected! Back to 2011, the OPEC showed a deep skepticism about shale’s boom sustainability and expressed their concerns in a public statement: “the shale oil should not be viewed as anything other than a source of marginal additions to crude oil supply”. Moreover, the oil demand was on a downward trend: legislators in the developed countries were promoting and encouraging the “green energy” and people were paying more and more attention to oil consumption and to alternative sources. On the other side, in the first half of 2014, the turmoil and the Arab revolutions, started in 2011, had almost eliminated Libyan oil exports, Syria was in the middle of a civil war and the Islamist fighters were conquering the city of Mosul. The latter represented a particular threat for the northern Iraq’s oilfields. Accordingly, all these news led analysts and fund managers to discount geopolitical risk and expect an increase in the oil price due to supply shortages. However, all of a sudden, in the second half of June, Libya got back on the oil market and the IS fighters turned out not to be able to conquer Iraq’s oilfields. It came out that geopolitics were not going to interrupt the crude oil supply, so, the oversupply became real and a price change was unavoidable. On Nov. 27, 2014 the most important news came out: the OPEC announced its willingness to leave unchanged the oil production at 30 million bpd. Cutting production to maintain prices artificially high would have been a sacrifice for Saudi Arabia because it would have helped shale producers in their expansion. The effects of the price drop were dramatic: oil companies had to start working hard to lower their break even points. 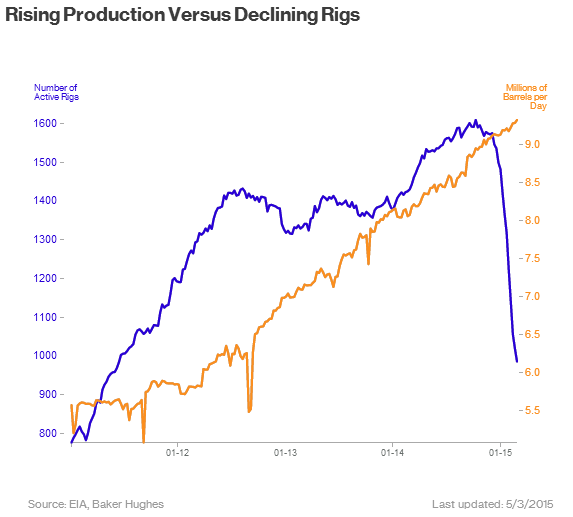 Many oil rigs have been shut down and cost cutting became a key issue. It came out that so far U.S. shale companies were more focused on extracting as much oil as possible rather than on cost monitoring. Lastly, this price drop led many companies to stock-build, reaching all time record levels. The price war had just started but, despite the common wisdom that it was just a fight between Saudi Arabia and North American shale drillers, it was more complex. In particular the U.S. shale’s break-even point was just in the middle between conventional wells in Arabia and expensive megaprojects as the ultra-deep water drillers. So there were more players involved to be considered. Oil prices have steadily fall over the past eight months leading to important political and economic consequences in oil importing and exporting countries. The former will benefit from a reduction in import costs which can boost their economies, while the latter will probably face significant revenue shortfalls in current account. 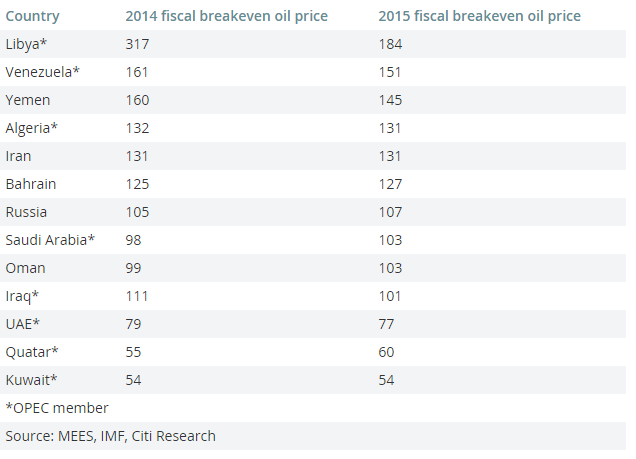 The impact on oil exporting economies varies a lot according to the break-even-oil price of each country. One of the biggest losers: its crisis began much sooner than the fall in oil price, in fact the contraction of its economy, the world’s largest inflation rate (60%), the currency devaluation and the political instability have led to a massive shortage of basic goods including food and medicine. The break-even point to balance its budget was $161 per barrel, moreover the 96% of Venezuela’s export revenues depends on oil exporting therefore the fall of nearly 60% of the oil price worsen the situation of an already unstable country. As result of this both political and economic instability credit rating agencies downgraded Venezuela to just one grade above default. To conclude, beside the fall in the oil price, the biggest mistake was the political mismanagement of the oil revenues over the last 15 years. For instance, as oil-dependent country, Norway invested the oil profits in a Sovereign Wealth Fund in order to adopt a countercyclical policy (saving up during price boom while softening the effects of the busts). Russia is the largest world’s oil producer and in 2014 accounted for about 14% of the world’s oil production. Its economy heavily relies on energy revenues, with oil and gas accounting for 70% of export incomes. Government attempts to increase export diversification in the last 15 years had failed and, on the contrary, Russia dependence on commodity prices had actually risen. Falling oil price has hit the country hard. Russia loses about $3bn in revenues for every dollar fall in the oil price, and according to the worst predictions (oil prices at 50$ per barrel) the 2015 current account will face a 150$ billion reduction in exports. The plunge in oil prices, western sanctions and political difficulties of the Putin Government played a big role in the depreciation of the ruble, which has lost almost half of its value against the dollar since the middle of last year. On one side, ruble depreciation has helped the current account to remain positive but, on the other, it has originated a dangerous inflationary trend and a consistent capital outflow due to loss of investor confidence. These combination of events will lead Russia into recession in 2015 (last data provided by IMF forecast a decrease of 3% of GDP) but the effects will probably continue even in 2016, as the rise of Russia’s interest rate could contribute to further deteriorate the economic environment. Government expects a 2015 fall in consumer demand by up to 9% and in investment by more than 10%. With oil price far below the $80 break-even price, the government has planned a 10% across-the-board budget cut, although military funding will remain untouched. Falling oil price is bringing growing political and economic pressure on Iranian Government led by Hassan Rouhani, who won 2013 elections on a promise to improve his nation’s stagnating economy despite Western sanctions. Historically, Iran had reacted to exports drop, due to the sanctions, increasing oil prices, but that strategy is no longer available. The government budget is almost totally dependent on oil revenues, as it needs oil at $136 a barrel to finance its spending plans. Furthermore, Iran was not able to accumulate during the years considerable foreign currency reserves. This is because Iran, unlike other OPEC members such as United Arab Emirates and Kuwait, has to face with greater domestic budgetary demand because of its large population size in relation to its oil revenues. Falling oil prices and Western sanctions have also contributed to Riyal depreciation which has increased inflation. As a consequence, the government has announced a reduction of the 2015 spending plan, which will amplify the negative effects on the economy of the 2014 spending review. The decrease in oil price is also weakening Iran’s position in international negotiations over Tehran’s disputed nuclear program. The effects of the recent fall in oil prices are not as straightforward as we may think. First of all, Europe is a net crude oil importer and its energy dependency rate for crude oil is around 80%. During the first half of the last year the high cost of energy was one of the main concerns for European companies. Therefore a sharp decline in energy prices (and so, energy expenses for companies) could lead to an increase of investments, employment and ultimately boost the output in the European Union. On the other hand, the most important negative effects, as for Japan, regards deflation fears. The energy costs are one of the main drivers of inflation: the Eurozone Harmonized Index of Consumer Prices (HICP) depends for 1/10 on energy costs. Therefore, it is estimated that the declining oil prices will certainly have a negative effect on inflation. However any opinion about inflation rate in Europe should take into consideration the ECB Quantitative Easing program that it is starting on March (09/03/2015). Concluding, the demand boost caused by the decline of energy costs may be reduced by the negative effects of deflation, as the customers could be encouraged to delay consumption and the companies to postpone investments. India is one of the biggest net importers of crude oil, so the oil price issue is impacting seriously on its economy. India is the third country for oil imports, just below US and China, importing nearly 3,782,000 bbl/day. Even if it is one of the largest oil importers, is also one of the world leaders in producing materials derived from petroleum. This sector has a deep impact on the India industrial GDP, therefore every change in the oil price could lead to a strong impact on the national GDP and, as a consequence, it could influence the government fiscal policy and reforms. It is estimated that a 10% fall in the current crude oil price could lead to a reduction of inflation of almost 0.2 percent and a GDP growth of 0.3 percent. In fact this situation has not only helped the Indian government to meet its fiscal deficit targets, but also, to support the reforms in order to tackle the structural economic problems that affects the country. The price drop allowed the Indian government (led by Narendra Modi) to raise diesel and petrol fuel taxes and at the same time cut the diesel price of nearly 30%. This government decision led to two main benefits for Indian Economy: firstly, it provided extra cash to the government for better implementation of reforms and also to support infrastructure and manufacturing initiatives, secondly it allowed reducing the inflation pressure on the economy of the country. To conclude we can easily include India among the winners of this oil price decline, especially from a domestic-policy point of view. The position of Japan, as a result of this fall in oil price, is not as clear as it might be for other countries. First of all, it needs to import about 84% of its energy requirements. Since 1973 Japan has been considering nuclear power a national strategic priority, becoming the world’s third largest producer of nuclear power after the US and France until 2011. Just after the Fukushima accident (March 2011), the Japanese Government decided a strong decrease in the role of nuclear power, moving toward oil, LNG (Liquefied Natural Gas), and renewable energy. However, starting from 2014, the new government decided to reintroduce the nuclear power as it is considered a key element of the energy policy in order to reduce the degree of dependence from fossil fuels imports. All things considered, at the present time, Japan is a net oil importer therefore it is benefitting from the current situation. However, the imports benefits from cheaper oil prices (denominated in USD) have been mitigated by the decline of the yen against the USD. To conclude, another issue concerning Japan and oil prices is about the inflation. Japan is facing extremely low inflation rate and difficulties in raising it at its target value (two percent): therefore the oil drop makes the inflation problem even worse. China is the world’s second-largest net importer of oil. During the last months, the reliance of China on imported energy, one of its historical weaknesses, has suddenly became a competitive advantage. Every $1 drop in the oil price corresponds to annual saving of $2.1 billion. This would mean a decrease in imports payments of about $60 billion in 2015. However, it is important to notice that China is taking advantage of lower oil prices to dramatically boost its storage capacity, diminishing in this way its future dependence from oil-producers countries. One of the biggest oil supplier is Iran, which has obtained a permission from the US to trade with China. The drop came at a moment when skepticism about Chinese prospects was rising. Anyway, thanks to the strength of the Yuan, financial reforms and the enormous amount of foreign exchange reserves, China will be able to strengthen its competitiveness, especially if compared to near countries affected by the dollar strength. The benefit of cheaper oil prices will not be entirely translated to consumption, as the government has planned to increase tax that will partly address the delicate internal environmental issue. Forecast about the consequences in United States of the drop in oil prices are not obvious. US is the third world’s oil producer but at the same time is the largest oil importer in the world, even if US dependence on foreign oil has dramatically decreased over the last five years. The growth of oil production since the introduction of fracking has been continuous, reaching in December 2014 the 1970’ level of 286,003 thousand barrels a day. However, the plunge in oil prices had an impact on the oil production. Capital expenditure has decreased by more than 20%, leading to the shutdown or suspension of the less profitable wells. As a consequence, the number of active oil drills has drastically decreased in the last few months, from 1,609 rigs in October to 986 in February. Cheap oil price has obviously reduced the profitability of oil services industries, whose stock prices have plunged over the last few months. It is also important to notice that the US break-even-point of $60 turned out to be overestimated, as there is still substantial room for improvement in drills’ profitability. The whole US economy is predicted to benefit from this situation. Reduction in gasoline price, combined with lower heating bills, will put an extra $120 billion in consumer’s pockets. A price of $60 would be enough to boost the rate of economic growth by a half of a percentage point. 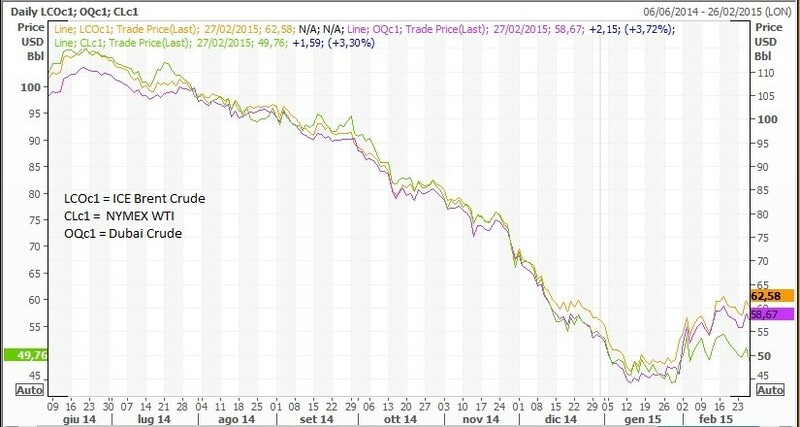 Nowadays, Brent crude oil price faces one-year declining rate of 46.14 %, reaching a market spot price slightly below $60 ($58.9 on 09/03/2015). In July, just before crude oil prices collapsed, the 2015 world demand was forecasted to grow by 1.35 million barrels per day. Despite the drop in oil prices, current demand growth averages only at 1 million barrels per day, which is the result of the decline in global expected GDP growth. OPEC countries are willing to meet the global demand for oil since they expect it to recover. Stocks at Cushing, Oklahoma, the US delivery point for WTI (West Texas Intermediate), are at a record high. Investors are taking advantage of the contango situation, thus considering storing cheap Brent oil, and making profits in the futures market. Financial Times figures show that oil inventories in Amsterdam-Rotterdam-Antwerp hub are 57 % full, which constitute a quarter of Europe’s storage. Data shows that the U.S is pumping oil faster than ever, with the highest production rate since 1972: oil production is increasing to 9.3mln barrels per day even though numerous refineries are on standby (source: Baker Hughes). 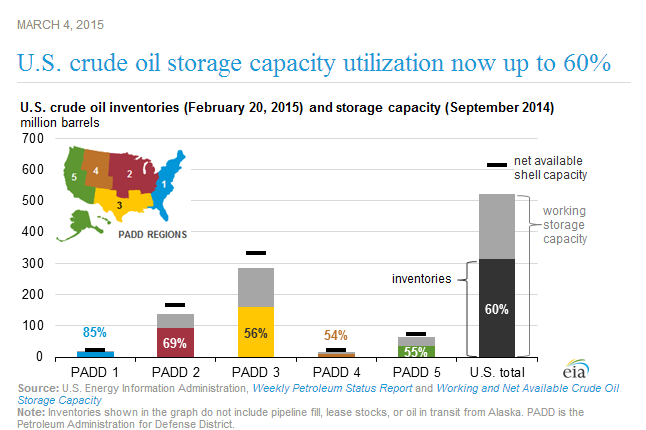 The U.S. Energy Information Administration reports that the U.S inventories are rising for the eighth consecutive week, already having increased by 2.4% to 444 mln barrels (03/04/2015). In addition, a rise in U.S currency, which reached its highest position since September 2003, made commodities priced in dollars more expensive and, at the same time, put pressure on oil prices. The decrease in oil prices had a negative effect on industry giants. BP and Royal Dutch Shell, Europe’s leading oil companies have announced a 20 percent drop in capex of over 15 bln per year from the beginning of 2012. A notable one-year decrease in stock price of Exxon Mobil from $104.25 on July 23, 2014 to $84.70 on March 9, 2015 resulted in the U.S leading oil producers significantly decreasing capital expenditures for 2015. If storage space runs out, prices could tumble again but supply will remain stable: it is more profitable for exporting countries to supply at lower margins rather than to seize production. A rapid decrease in storage space would require the construction of new storage facilities for storing excess Brent crude oil. Based on the current oil market conditions, investors should take into special consideration the time value of money, holding costs and future prices. If market does not recover, holding inventories for a too long period of time can result in further devaluation of oil prices. On one hand, declining oil price is causing a revenue decrease for every oil company. On the other, it will put a particular strain on smaller producers, leading them toward an unavoidable business restructuring. As a consequence, we can expect that big and healthier companies will take advantage of this situation, pushing the M&A activity in the next few months.